Gluten free coarsely ground wholegrain oats* 59,5%, chopped figs* 8% (figs* 97%, rice flour*), apple cubes* 8%, date granule* 8% (date juice concentrate* 60%, rice flour*), sultanas* 6% (sultanas* 99,5%, sunflower oil*), chopped and roasted hazelnuts* 5,5%, apple flakes* 5% (apple purée*, rice flour*, apple juice concentrate*). 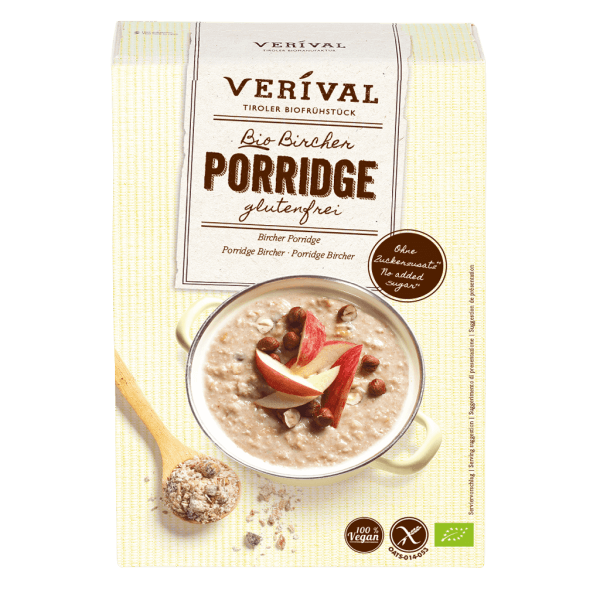 Put 50 g porridge (6 tbsp) in a bowl and pour over 100 ml boiling water or 80 ml hot milk (depending on the consistency desired). Stir, leave to soak for 3 minutes and enjoy warm. For “Overnight oats“: Add a bit more cold water or cold milk and leave to soak overnight.